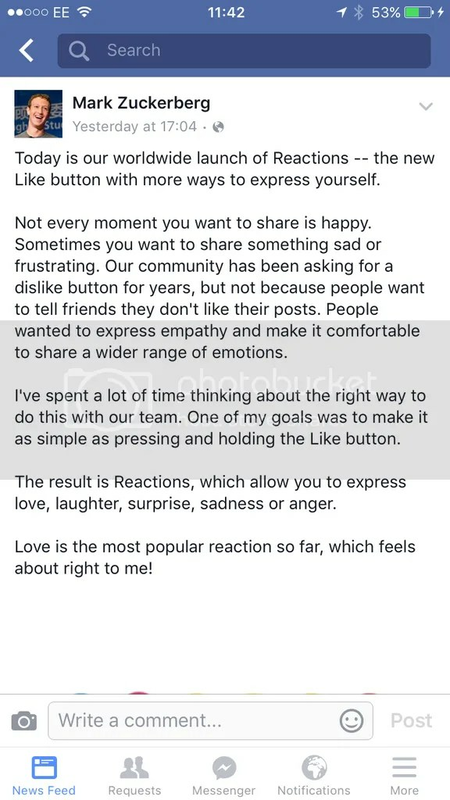 Only a few days ago, Facebook finally started to roll out it’s long-awaited ‘Reactions‘, followed shortly by the below post from founder Mark Zuckerberg. But however much Zuckerburg might be discussing this on a personal level, I have the feeling that this feature is really for the large companies using Facebook. As someone who manages several commercial Facebook pages, despite experience and knowledge it can sometimes to frustrating to try and figure out why certain posts do well organically. Why do certain posts resonate with people, why are they sharing it in particular, how are they engaging with it? The sterile figures of reach/view/share/comment often don’t really help. With reactions, you can have a much better idea of what is motivating people. If I were to post a political piece about arts cuts, is it making people sad, or is it making them angry? Does news about a long-awaited theatre revival just make people happy (“like”) or are they amazed (“wow”)? Knowing what your audience’s emotional response, knowing what drives them, instead of just looking at raw numbers and then guessing, is an incredibly useful thing to be able to report on, and to be able to build on with future campaigns. Massive thank you and shout-out to @bethmwells for discussing this with me and suggesting ideas.